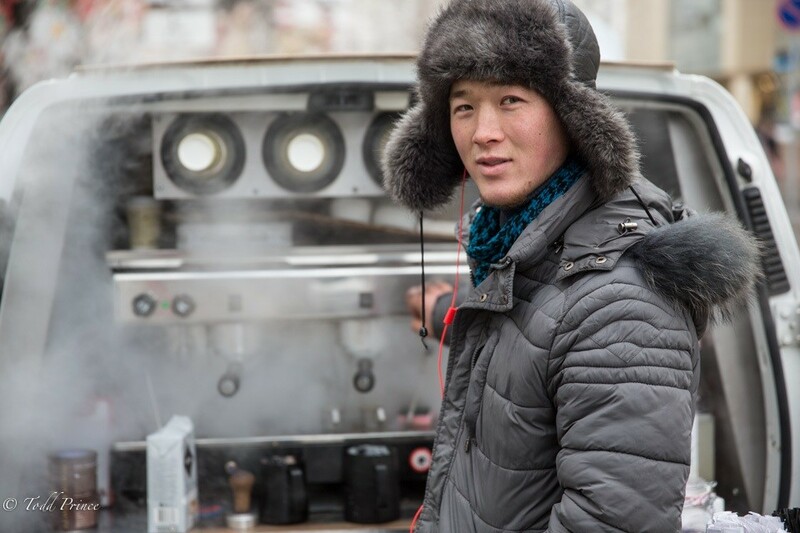 He was making espresso and cappuccino near a Moscow university from the back of a ‘coffee car.’ These coffee cars started appearing about 1-2 years ago here and are becoming a bit of a trend as people get used to coffee-on-the-go. He said the machines can work in temp as cold as -15c. His company chose this location as ‘students like to drink coffee.’ The ruble drop has boosted his company’s costs by 30%. They haven’t yet passed on the costs to coffee drinkers, but his coffee is still cheaper than the Starbucks 100 meters from his car. I asked him about thd big moments in his life in 2014. He said he moved recently to Moscow from Kyrgyzstan in Central Asia to save money to build a home. He also said he was Muslim and began reading for 1st time a prayer book, which has had a very big impact on his life. “Before, I didn’t know the purpose of life, where we came from. I am trying to find the answers.